Gendarmes and police officers investigate the scene at a supermarket after a hostage situation in Trebes, France, March 23, 2018. After a months-long lull, another terrorist attack has hit France. The Islamic State group has claimed responsibility for shooting and hostage-taking incidents in southern France Friday that saw four people killed — including the suspect, who was shot dead by police. Authorities have identified the suspect as 25-year-old French Moroccan Redouane Lakdim — a small-time drug dealer who was reportedly under surveillance for potentially being a religious radical, although he was not considered a security threat. Interior Minister Gerard Collomb said Lakdim first shot dead a driver while stealing a car in the southern town of Carcassonne, then opened fire on police out jogging Friday morning, wounding one of them. His next target was a supermarket in the nearby town of Trebes. Reports say Lakdim shouted “Allah Akbar,” fired into the air, and took hostages. According to Collomb, a police officer volunteered to swap places with a hostage Lakdim was holding as protection. The policeman kept his mobile phone open so police outside could hear what was taking place. When they heard firing inside, they stormed the store. Altogether, four people were killed in the incident, including the suspect. Another five were wounded, including the officer who volunteered as hostage. 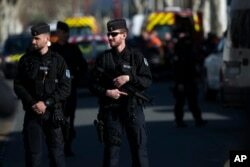 French police officers cordon off the area around a terrorist attack in Trebes, southern France, March 23, 2018. Media reports say the assailant demanded the release of Salah Abdeslam, considered the top surviving participant in the November 2015 attacks in Paris that killed 130 people. Abdeslam is currently in a high-security prison outside the capital. The events in southern France are eerily similar to the attack on a kosher supermarket in Paris in 2015 — one of a string of terrorist attacks that year that left scores of people dead. A year later, France was struck by another major attack — in the Riviera city of Nice that killed 86 people and left hundreds of others injured. No major attack has occurred since then, although authorities say they have foiled a number of planned strikes.